If you were to ask “The Gentleman” where he feels happiest, you might expect him to answer standing over his opponent with a referee holding his arm up. Or perhaps, if you knew his personal film preference, you’d think him to say on the couch watching a Disney movie. A good guess, considering that’s where he can be found most nights until the early morning hours. But the real peace of mind Jason Powell the second hopes to find, once he hangs up his gloves, is somewhere far up along the Oregon coast with his mother and two sisters. They say that when you step into the ring you forget about everything. In the blink of an eye your shot can be gone. 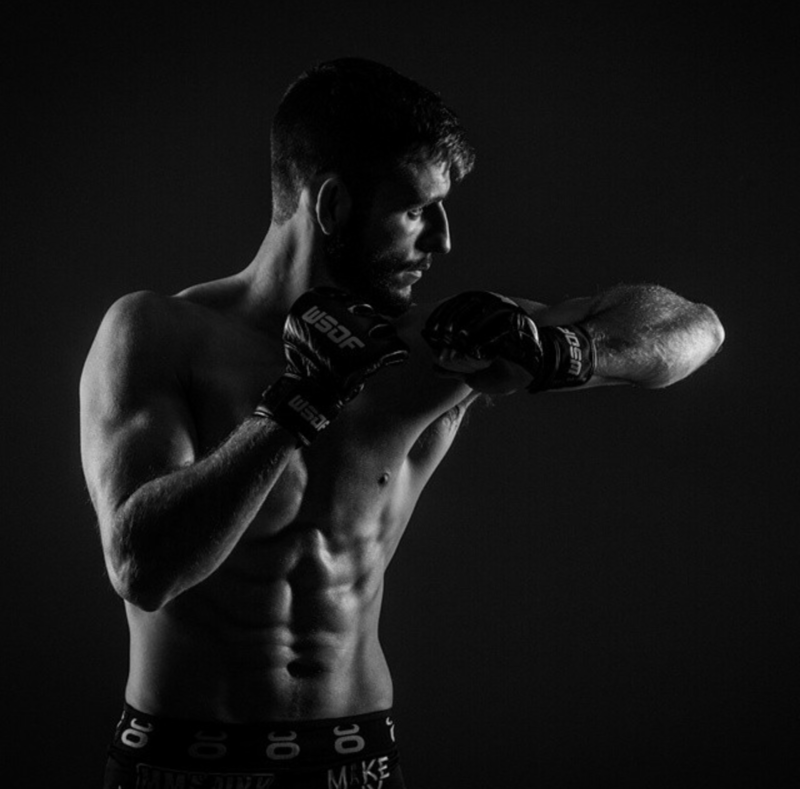 Fighters dedicate the months before the bell rings to thinking about those few moments of battle, training their instincts to take over and allow them to leave the octagon victorious. Four years ago, Powell stepped into his first ring at the Butte County fairgrounds arena in Gridley, California. The short-ceilinged structure, most often utilized for 4H competitions has openings along the backside instead of windows, providing patrons in the upper bleachers space to lean out and drag a cigarette without losing their seat. Hank Williams Jr. echoed through the small stadium with the scent of spilled light beer mixed with sweat from the other fights that lead up to Powell’s debut. While the spectators stood up from their collapsable folding chairs and bleachers to greet him, an official checked his gloves and hair which had been dyed for the occasion, one side black, the other blonde. The multi-colored amateur would be locked in the cage with Deniko Sisk for only one round. Seconds after touching gloves, Jason threw a roundhouse kick towards Sisk’s head. It missed, but he quickly followed up to put Sisk on the ground and made it a grappling match before the crowd had settled back into their seats. Tangled, the contestants would rise only once more before the fight ended. A quick succession of punches landed on Sisk’s face before the referee called the match and pulled Powell off of his opponent. The moments after the fight felt surreal as it was also his first milestone on the path towards his longtime dream, holding a Ultimate Fighting Championship title. Returning to The Ridge, the small hill community punctuated by the Feather River and Butte Creek was ideal, Powell says. Today, he splits the days of the week between El Dorado Hills and his grandpa’s house in Paradise. The commute to Urban Sprawl Fitness outside of Sacramento is a small price to pay, in order to stay with his family member and in the town which supports his career. However, the Gentleman’s story has had its share of turns to bring him to where he is today. It’s not been without a few stumbles that Jason Powell now stands tall. Powell’s first love was football. For over a decade he played the sport between snaps and also excelled at wrestling. The interest in mixed martial arts started after he’d been into other sports but quickly turned to his obsession at the end of junior high. Reflecting on the exact moment his young mind separated WWE from professional fighting, Powell says, “I watched one Frank Shamrock video and that was it.” The day after he turned 16, Powell would go to the local gym where he began training for the cage. Sometimes these sessions even came after a long day of classes and football practice. Jason was born in Paradise but grew up about 50 miles away in Willows, a town even smaller in population. It wouldn’t be until his senior year of high school that he would transfer back to finish out his football and wrestling careers as a Bobcat. Fast forward to 2016 and you wouldn’t have thought that Powell was meant for anything other than the ring. With a model-esque smile next to his family at Disneyland Jason might garner a hundred likes on social media, and one might think of him as a pretty boy but at closer examination his body bears the undeniable marks of a fighter. Underneath a cap that has his fighting name in neat cursive, he sports a mullet so dirty Joe Dirt would shudder. Determining which fold is which in Jason’s ears is difficult, as they all seem to blend together from the unmeasurable amount of times they’ve been grabbed by opponents. On his bicep there’s a tattoo that reads “CMF,” an acronym created by Paradise athletes in the early 2000’s whose double meaning of Crazy Mountain Folk, and Crazy Mother Fucker, has been tabooed by local school administration to this day. In a small town serious about its competitive sports programs, the few athletes that reach a higher level of play can be idolized. As much became apparent when in 2011 Jeff Maehl began playing for the Oregon Ducks. As the football team’s ranking rose and the skinny receiver pulled in more catches on national television, sweatshirts and basketball shorts displaying the yellow O became the most common articles of clothing worn at Paradise High school. Jason is arguably the most loved athlete from Paradise to not play football. He is one of the few fighters that can personally sell out 100 tickets to a fight. Almost any picture of him in the ring receives hundreds of likes and after any given fight his phone is constantly blowing up with congratulations. While the support and belts that Powell has rightfully earned are glamorous and enjoyed, it’s been not without sacrifice that he’s gained this recognition. Once a date is set for Jason to fight, he begins the long training process of a fight camp. This consists of splitting his time to train at Freestyle Fitness and Americana Brazilian Jiu Jitsu in Chico as well as crashing in El Dorado Hills three days a week to train with MMAGOLD, a Sacramento based team now boasting 60 fighters. In the months out from a fight, Powell can weigh as much as 161 pounds but in order to fight in the featherweight class, he must be below 145 at weigh-ins. To achieve this, his training regimen and dietary habits have to be very carefully crafted and executed. Asleep at 2am awake at 10am. He eats only two turkey and cheddar wrap a day one at 2pm and the other at 10pm with only one Nature Valley Bar and a bag of almonds in between. In the early stages of a fight camp, Jason is also allowed one “cheat day” on which he says he can always be found at Mountain Mike’s eating a whole pepperoni, sausage and bacon pizza himself with a near gallon of Mt. Dew to wash it down. When he is a few weeks out from his fight and trying to slim down, its 3 oz of ground turkey, 2 oz of cucumber and one packet of plain oatmeal with honey…five times a day. In the summer of 2013, Jason and his cousin Brandon Waltz signed with MMAGOLD, which their friend Benito Lopez had joined only a few months earlier. Now part of an official team with flashy gear and outside sponsors, the Butte County natives moved into an apartment in Fair Oaks to be closer to their gym and coach at the beginning of the new year. All enjoying successful careers and being under the same roof, one would expect the young men to be having the time of their lives. Jason however felt quite the opposite. After spending his life in rural areas with wildlife and scenery, the shift to a more urban town made him depressed. “I always get homesick and hated Sac,” he says. To add to the discomfort in a strange land, Jason’s girlfriend of three years broke up with him the week after he’d moved into his apartment. Also, his mother told him that she was moving from Willows to the Oregon coast. Now instead of being an hour and a half away from his mother and two sisters, they were almost 8 hours apart. Suddenly, the support system that made Jason successful had crumbled and even with two of his closest friends nearby, he couldn’t have felt more alone. While days spent in the apartment and gym passed unremarkably except for their isolation, the most important fight in Jason’s career was quickly approaching. His professional debut fighting on a Bellator ticket. The fighting league broadcasted nationally on Spike TV has had tickets featuring well known competitors like Tito Ortiz and Rampage Jackson. It also was a perfect opportunity to show how far he had come since his first knockout at the Gridley fairgrounds. Almost 100 of Jason’s friends and fans had purchased tickets to the event and made the trip to the Reno Events Center. While in staging and warming up for his biggest fight yet, he later admitted to have been thinking about his ex and everything else except for the match. Even when he entered the octagon and stared Sinjen “The Saint” Smith in the eyes, Jason’s thoughts were elsewhere. His distractions became apparent, as only 1:52 into the fight, he was caught in an armbar and forced into submission. A mistake that to this day, he shakes his head about. The loss was the wake up call that Jason needed to break his haze of depression. “My training was just going through the motions with a broken heart,” he says. Despite losing his first professional fight ever, the taste of fighting on a big ticket had proven to be what was necessary to build Powell back up. “ I felt like I had let my fans down, but I wasn’t intimidated at all by the level of competition,” he reflects remembering the bright lights and announcer calling his name, “The cameras in my face, I loved that.” It was clear that even in the most depressed months of his life and dealing with the first loss of his career, Jason knew that the dream he’d chased since junior high was alive and needed to once again be the focus of his life. Though, he rebounded after his loss and won back to back fights in September and December, Powell didn’t fight a single match in 2015. On one ticket his opponent backed out and failed physicals forced Powell to pull himself from a different bout only weeks later. Even though he was finally reunited with the most supportive women in his life and enjoying the simplicity of retail work, the cage in California once again called. Powell says that moving to Lincoln City was the final piece of coming to terms with the darkness that had haunted him a year before. “I saw my family was happy up there. They had good jobs and were enjoying life.” With saved up funds from working and his piss blood-free, Jason returned to the town on the ridge. Since that night in Reno almost two years before, Jason’s career is back on a familiar track. He now stands at a record of (8-1); (3-1) since becoming a professional. Late this past January his most recent bout in Sacramento against Sergio Quinones proved sensational. Quinones is an experienced fighter who has been in the cage since 2007, when Powell was still a freshman in high school. Fans of the Gentlemen flocked to the McClellan Conference Center wearing shirt tuxedo’s and MMAGOLD gear to support their local fighter. Despite having been in more than three times as many fights as Jason, The Gentleman used his wrestling experience as well as combination strikes to hold his own. The match was called in the second round after Powell shook Quinones with a straight left that put him on his knees. Following the blow, Jason mounted his opponent who was now bleeding from below his eye. It was a short amount of time and flurry of punches before the referee called the match and Jason climbed the fence to acknowledge the crowd. With Quinones blood smeared on the side of his head, he blew kisses to his fans, all traces of the depressed young man had disappeared and The Gentleman was back on top. Today, he is in the middle of another fight camp, closing in on a bout against Bakersfield fighter, Ryan Reneau. Until May 7th, Powell’s training involves watching the clock for his next meal and traveling to Sacramento to workout, the only thing concerning to him is the next time he will enter the ring. While the lifelong dream of becoming a UFC champion might be years off, Jason Powell is well on his way and continues to chase his goal with the ultimate patience and discipline of a true gentleman.